Introducing the new, official collector's busts series, featuring the Dark Knight and his greatest allies and enemies from the movies, TV and comic books. Each character has been digitally sculpted by a team of expert modellers, using exhaustive reference material for a high level of detail. Each bust faithfully reproduces all the details before being individually hand painted. The greatest collection of Batman busts representing over 75 years of DC Comics! Order Your Batman™ Bust today! Get These Exclusive Gifts Worth Over £70! Keep your magazine collection in pristine condition in this unique BatmanTM Universe binder. FREE with your 2nd delivery. 5 high-quality art prints from all of the BatmanTM universe PLUS their own protective tin. FREE with your 3rd delivery. This highly collectable DC Comics watch features quartz movement, an engraved alloy case, silicone strap and its own collector's tin. FREE with your 5th delivery. Exclusive to subscribers, this bust of Batman's world's finest partner, SupermanTM, joins the array of allies in his DC Comics: The New 52 guise. The SupermanTM bust is in scale with the rest of your collection. FREE with your 8th delivery. Batman Universe Collector’s Busts builds into an extraordinary collection of life like statuettes featuring the Dark Knight, his allies and enemies. A collection from over 75 years of comic books, TV, video game, and movie history. Sculpted by expert modellers, individually hand-painted and fully approved, these Batman universe collector’s busts measure over 128mm tall and each comes with an in-depth magazine. 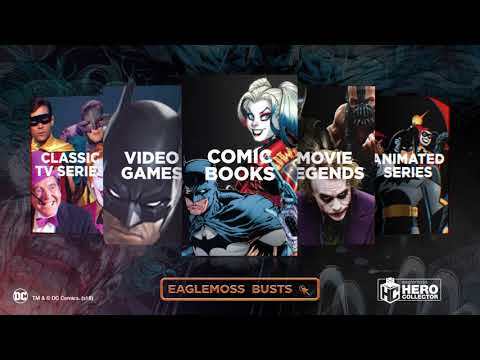 Each bust comes with a fully illustrated collector’s magazine that provides an in-depth history of the character from their first appearance to the present day. These high-quality statuettes feature not only the Dark Knight in his many guises, but also his trusted allies and greatest enemies from over 75 years of comic book, TV, video game, and movie history. The Dark Knight in his many guises, from over 75 years of comic book history. If your questions are not answered below, please contact us. You receive the Batman bust for just £4.99 plus FREE P&P. Then each month you will receive 2 new busts for only £14.99 each with FREE P&P. The collection is currently planned to be 60 issues however it is possible that this may be increased. FREE gifts are exclusively available to customers with an active subscription. The 5 art prints and collection tin are sent with shipment 2, the collector’s binder with shipment 3, the Superman vs. Batman watch is sent with shipment 5 and the Superman bust is sent with shipment 8. Free gifts are only available with an active subscription. If your subscription is cancelled prior to a free gift being due, you will not be entitled to receive the free gift or any subsequent free gifts.